Bioidentical hormone therapy involves a set of hormones given to women to help their bodies combat the most frustrating menopause symptoms. After understanding bioidentical hormone therapy and its safety, then you will be able to fully understand what the pros and cons of this therapy are and whether you should use it as a way to counter the many symptoms of menopause. Bioidentical hormone replacement therapy (BHRT) is a term used to describe the use of hormones identical to endogenous hormones, which are molecularly uniform to those naturally produced. 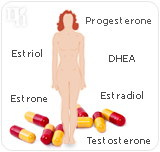 The specific hormones that are used in bioidentical hormone therapy vary, but can include estrone, estradiol, progesterone, testosterone, dehydroepiandrosterone (DHEA), and estriol. Bioidentical hormone replacement therapy is practiced in the United States as a form of alternative medicine. Bioidentical hormone therapy is often called "natural hormone therapy" because bioidentical hormones act in the body just like the hormones women produce. Not only are bioidentical hormones promoted to fight menopausal symptoms, but they are also implemented as a treatment to reduce the risk of osteoporosis. Reduced risk of colorectal cancer. Bioidentical hormones have been known to reduce the risk of colorectal cancer in women. Fewer fractures. Bioidentical hormone therapy can strengthen bones and decrease the chance of developing osteoporosis. There is no proof that compounded hormones (BHRT) have fewer side effects or are more effective than hormone replacement therapy (HRT). Some studies claim that the hormones decrease breast cancer and endometrial cancer risk while others increase menopause symptoms. These claims are unproven. However, here are the better known related side effects. Increased risk of heart attack. 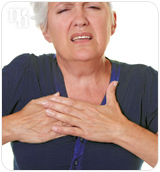 Many women who used bioidentical hormone therapy regularly during menopause were reported as being at a higher risk of heart attacks than women who took natural supplements during menopause. Increased risk of stroke. When a woman begins taking bioidentical hormone therapy, it causes drastic changes in her blood and the way her body functions; this can lead to increased risks of strokes. Increased risk of blood clots. Bioidentical hormone therapy can increase a woman's risk of blood clots. It is important for any woman who decides to use bioidentical hormone therapy to be conscious and aware of this. Increased risk of breast cancer. An increase of estrogen levels in a woman can lead to breast cancer. 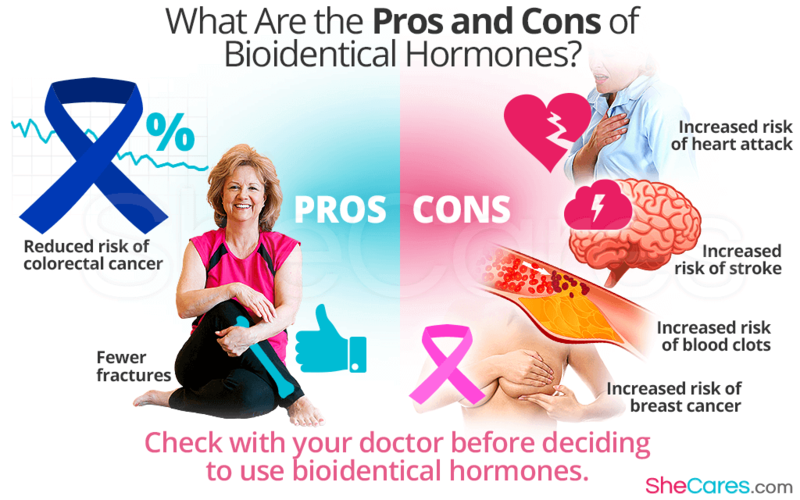 In addition to the other side effects, it is important for women to weigh the pros and cons of menopausal relief using bioidentical hormone therapy. Before you decide to use bioidentical hormones to fight your menopause symptoms, be sure to consult your doctor. If you want to learn more, click on the following link about other alternatives to bioidentical hormones.